When you want to do more than just wear your heart on your sleeve... make a ta•ta•statement! 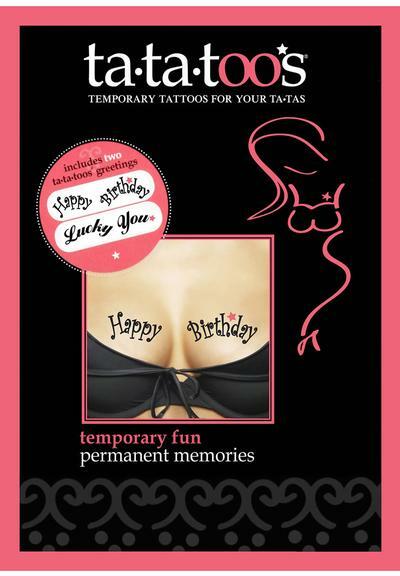 On the face of it, that's a simple question with an easy answer: temporary tattoos for your ta•tas. Yet that explanation fails to capture the essence of ta•ta•toos®. Yes, they start out as temporary tattoos. But in the right hands, ta•ta•toos® wind up as permanent memories. Treated like a personal greeting card, ta•ta•toos® are temporary tattoos, worn on your "ta•tas," that relay sentiments in a fun, intimate and original way. So whether you're looking for something different for someone special, a laugh, a gag or just some fun, let your ta•ta•toos® do the ta-ta-talking. ta•ta•toos®: when you want to say it all, but leave plenty to the imagination. Comes in a 2 pack. Included is a "Lucky You" ta•ta•toos® Tattoo.